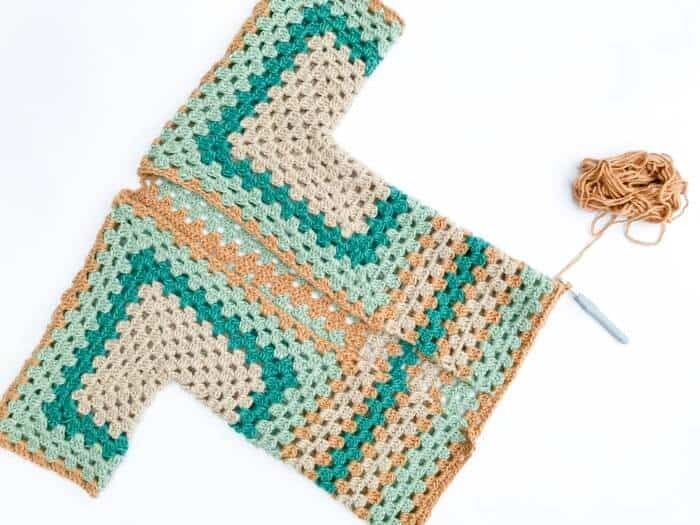 In Part 2 of this free crochet sweater pattern, we’ll learn how to lengthen the bottom of your “Campfire Cardigan” and add sleeves. 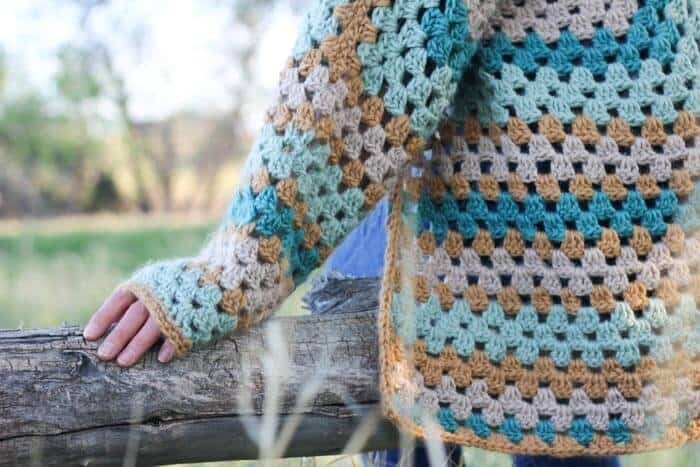 You can also check out Part 1 and Part 3 of the free pattern or purchase the complete ad-free, printable PDF of the pattern for $2.75 here. 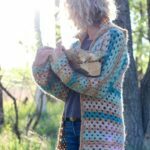 Are you feeling good about how your hexagons came together in Part 1 of the Campfire Cardigan pattern? 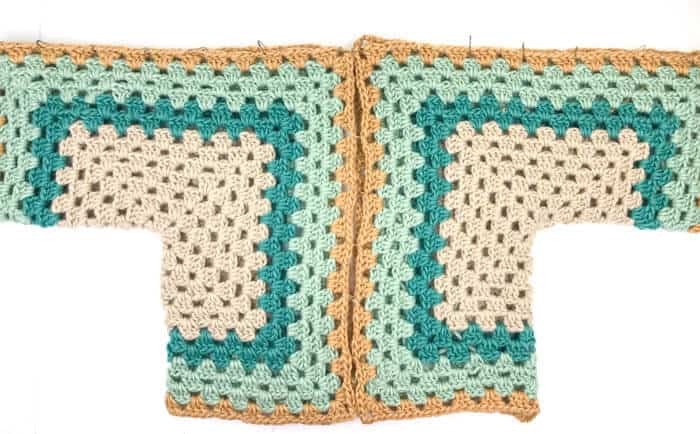 Even just as a little shrug, I bet your sweater is already looking pretty cute! 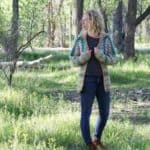 Okay, so in Part 2 of this free crochet sweater pattern, you’ll really have a chance to start customizing your cardigan to fit your body. I know that could sound scary, but in this case it’s really very doable! 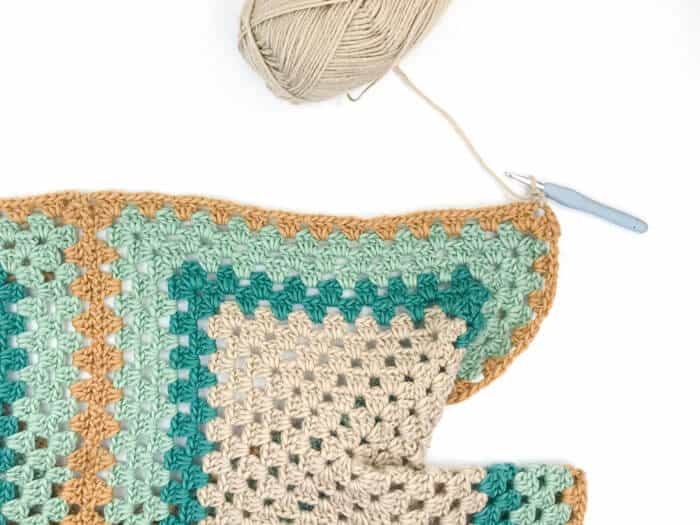 First, we’ll add rows of granny stitch to the bottom of the cardigan to make it the length you like. Next, you’ll have two choices of types of sleeves to create. The sleeve pictured in the sample includes some decreases, which give it a modern taper. With decreasing in granny stitch though, I found that there was a little puckering that made the sleeve just slightly bumpy looking. As you can see in the photo below, it’s really minimal, especially when you’re wearing it. If you’d prefer a super smooth sleeve though, you can work the non-tapered sleeve option which will result in a wider, more 70’s style sleeve. 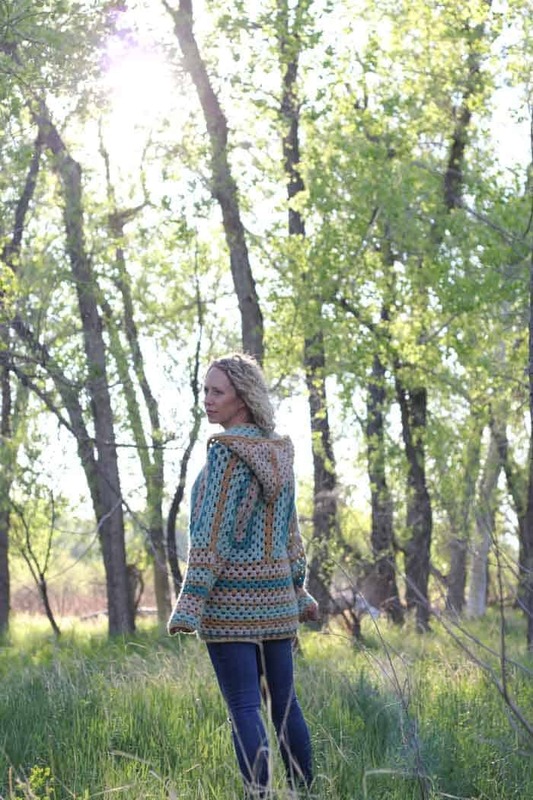 Later this week in Part 3 of the Campfire Cardigan, we’ll add the hood and a border to finish things off. View Part 1 of the pattern to make the hexagon base and seam the arm holes. • To switch colors at the end of a row, use the color of the upcoming row to complete the final yo of the row you’re finishing. Fasten off previous color. Proceed with new color in the next row. See photo below from the Logan House Wrap pattern for a visual explanation. With RS of sweater facing, attach Color A at what will be the bottom, front left corner. 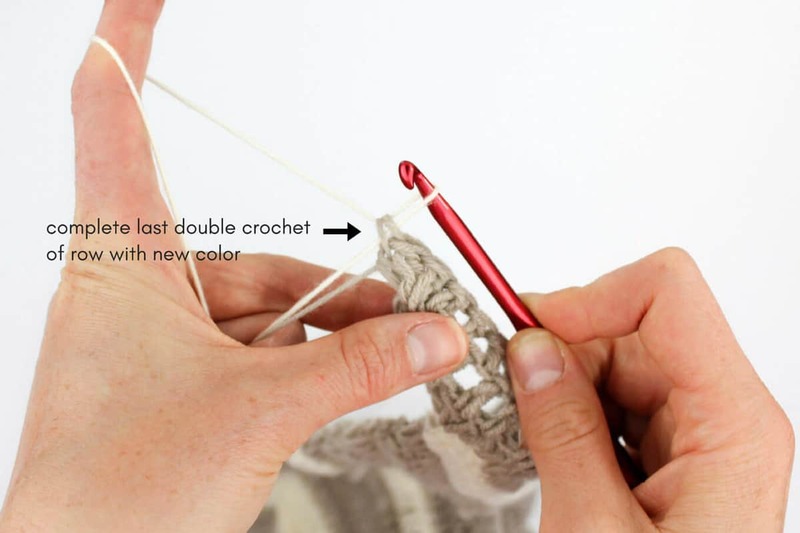 Left-handed crocheters: Attach Color at bottom, front right corner. Row 4: Using Color B, rep Row 2. Row 7: Using Color A, rep Row 1. Row 10: Using Color C, rep Row 2. Row 11: Using Color C, rep Row 1. Row 13: Using Color D, rep Row 1. Row 15: Using Color A, rep Row 1. Size S/M: Try on cardigan to evaluate if you like the length. Fasten off or work Rows 18-19 if desired. Sizes M/L and L/XL: Continue with next two rows. Row 18: Using Color A, rep Row 2. Row 19: Using Color B, rep Row 1. • Again, this section is easily customizable to fit your arms. Work fewer rows for shorter sleeves or more rows for longer sleeves. -The non-tapered sleeve option does not include decreases. Therefore, the wrist opening will be as wide as the current arm opening on your sweater. This creates a more “70’s” style sleeve. -Alternatively, you can create a more traditional sleeve shape by working the tapered sleeve option (pictured in the sample and in the photo below). 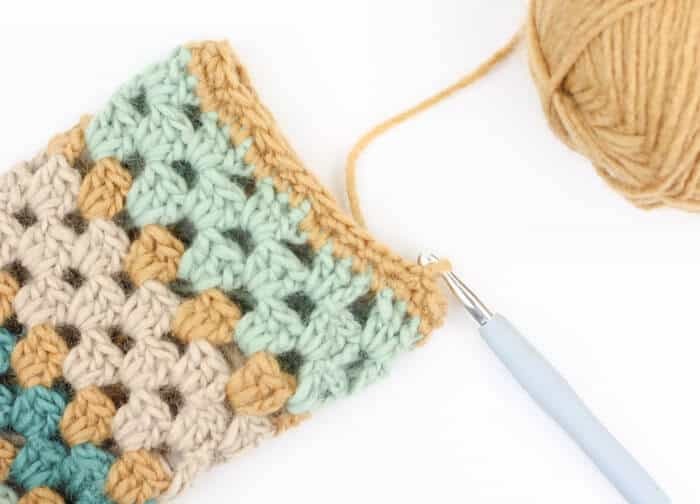 Because of the nature of decreasing in granny stitch, this sleeve might have small bunches where the decreases take place, although they are not very visible once the sweater is being worn. • On decrease rounds, the first 3 ch and dc, plus the last dc of the round equal one total cluster. Because the cluster is a bit spaced out, it can be easily mistaken as ch1sps. Be sure not to accidentally work a 3 dc cluster into these gaps. 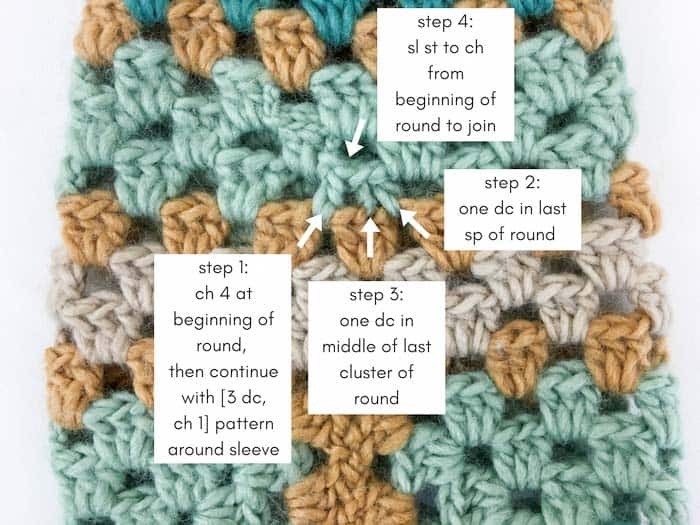 See photo below for a more detailed explanation of working a granny stitch decrease on the sleeves. • Decreases are spread evenly between the top, sides and bottom of the sleeve to minimize any bunching. Lay sweater flat so seam is at top of sleeve. Attach Color A in the middle dc of a cluster that’s at the bottom side of the sleeve, directly opposite the sleeve seam. Round 2: Using Color A, ch 3, 2 dc in same sp, ch 1, (3 dc, ch 1) in each sp until end of round, sl st to join, 1 sl st into next dc. Attach Color D in any sp along underside of sleeve. Round 3: Using Color D, rep Round 2. Attach Color C in the middle dc of a cluster at the top of the sleeve. Round 5: Using Color C, rep Round 2. Round 6: Using Color C, rep Round 2. Attach Color D in the middle dc of a cluster at the back side of sleeve. Attach Color B in any sp along underside of sleeve. Round 8: Using Color B, rep Round 2. Round 9: Using Color B, rep Round 2. Attach Color D in the middle dc of a cluster at the front side of sleeve. Attach Color A in any sp along underside of sleeve. Rounds 11-12: Using Color A, rep Round 2. Work Round 13 according to the size you’re making. (S/M) Round 13: Using Color A, rep Round 2. Round 14: Using Color D, rep Round 2. Attach Color C in any sp along underside of sleeve. Rounds 15-17: Using Color C, rep Round 2. Sizes M/L and L/XL: Work additional repeats of Round 2 to lengthen sleeves if desired. All sizes: Attach Color D in any dc along underside of sleeve. Round 19: Ch 1, sc in each sc, sl st to first sc to join. Lay sweater flat so seam is at top of sleeve. Attach Color A in any space that’s at the bottom side of the sleeve, directly opposite the sleeve seam. Work Rounds 1-19 using the colors specified for each round in the “tapered sleeve” section. Rounds 1-17: Ch 3, 2 dc in same sp, ch 1, (3 dc, ch 1) in each sp until end of round, sl st to join, 1 sl st into next sp. 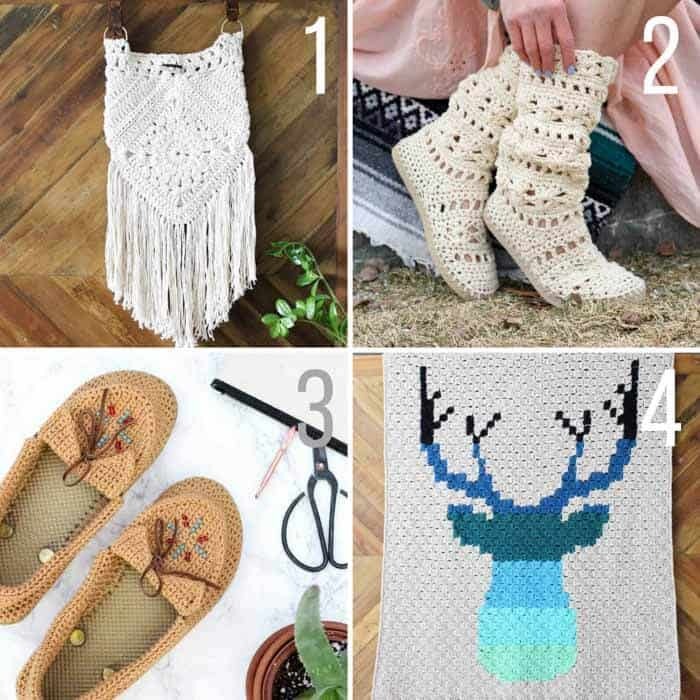 You might also enjoy these free crochet patterns from Make & Do Crew! 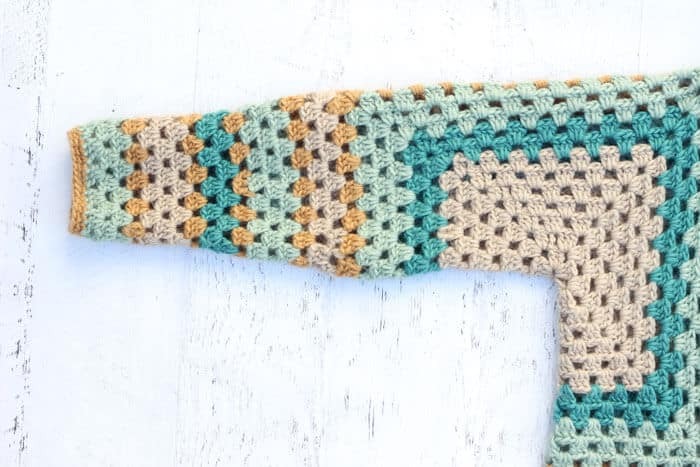 To make this a plus size , IF I use a larger crochet hook it should work right?? Hi. I have finished this up through the hood part 3. Can you please email me with those directions. Thank you so much. Wow, Susan, I’m SO impressed! You really cranked that out quickly! You can find Part 3 here if you haven’t already. Thank u for your patterns, I am making the camfire cardigan, in colors I like, what I have at home (yarn). I am enjoying it, and am going to try some of your others. Thank u again.? Wonderful! Isn’t it nice to be able to use your stash yarn for something you’re excited about? Thanks for that feedback, Rebecca. The construction of this type of sweater does create wider sleeves the larger the hexagon gets. When I get time, I think I’m going to experiment with a set of hexagons with one shorter side (to fold into the sleeve and see if something like that might work to make a thin sleeve on a larger size. What a great idea! Thanks for sharing that with us. I’m sorry, at this point there’s not a full video tutorial for the pattern. There are a lot of photos included in the written pattern though that might be helpful to you. You can start with Part 1 here. I’m sorry, right now I don’t have a slower video tutorial. Each section contains some tutorial photos though that I hope will be helpful until I get a video tutorial created. Hi, I’ve just finished both hexagons. Does the hood attach to the fronts as I’m unclear from the instructions and the tutorial. Many thanks. 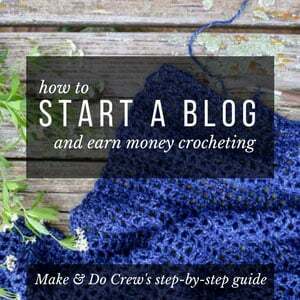 I’m so happy to hear your spreading your love of crochet! The hood does indeed attach to the fronts. You can sort of see in some of the photos that it’s worked a bit on the front of each side and along the back of the sweater. I’m probably not as experienced as most of your subscribers, but I think this pattern is genius. So easy even I can make it. I have to say you have a new fan. If I had any crochet friends I would so recommend you. Thanks a bunch for sharing. and……I can hardly wait to try your newest slippers. 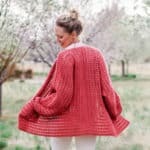 I have a question on the tapered sleeve part of the pattern. 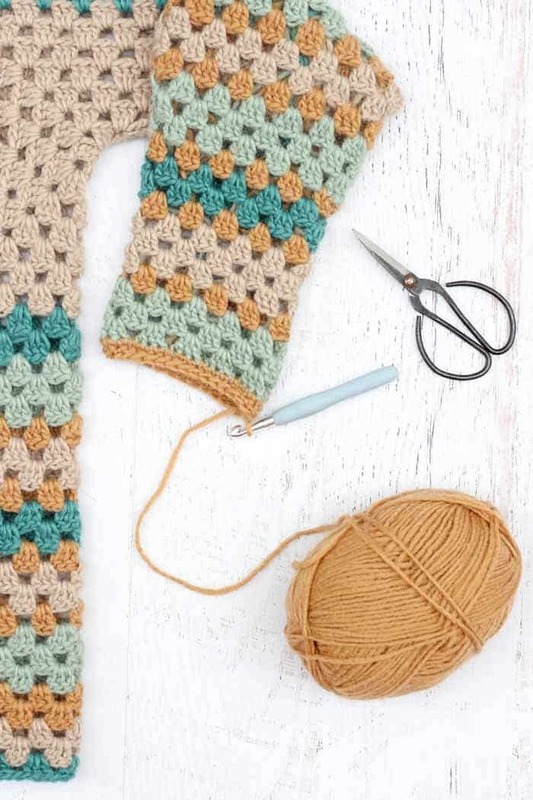 When it says to repeat the decrease row, then the notes say to connect the next yarn directly opposite the seam, how does that work. The image is different than the row one decrease. I hope that makes sense. 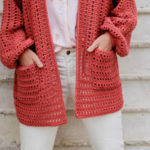 I’m making this cardigan in one color. 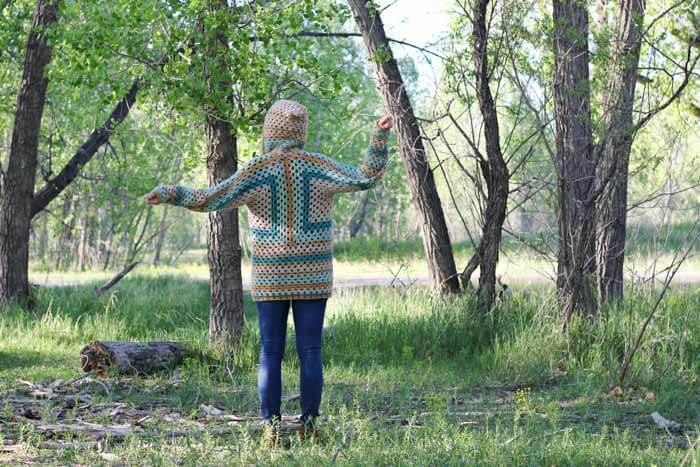 My question is when doing the extra rows to make the sweater longer, should I fasten off each row? I’m assuming I do. Love it so far! Never mind my question. Read the directions agai and saw mention of turning chain. LOL! I am working on the cardigan bottom and I am confused about row 2. Where is the turning chain supposed to be? I tried to go on with the next row but it doesn’t look right to me. Thanks for the great pattern! I’m currently working on the length of my first one! I’m thinking once I’m completely finished about sewing up the front to make it into a pull over! I love that idea! I’ve been pondering something similar actually. Will you please send me a pic if you decide to do it that way? I’d love to see! I made 2 of these and I recommend lion brand mandala because there is no need to change color. I also recommend after having 11 clusters per side (I am a large) to continue around 3 sides to get width and length without making arms so big you give up! I stopped width at 10 and just did the length to finish off a cake. Each side takes 1 cake except for sleeves. You will need an extra cake for sleeves and for sewing. Happy hooking! Hi making this for my mom and she has longer arms. So I want to increase the length of the sleeves. I’m wondering where u measured the sleeves from to get 22″? As if I measure the whole sleeve I’ve made with just the hexagons from the neck to the end it’s 24″ already. I haven’t started the sleeve yet! Thanks.